The HCCI SkyAktiv-X Is Mazda’s Latest WOW Engine! - Muscle Cars Zone! The HCCI SkyAktiv-X Is Mazda’s Latest WOW Engine! 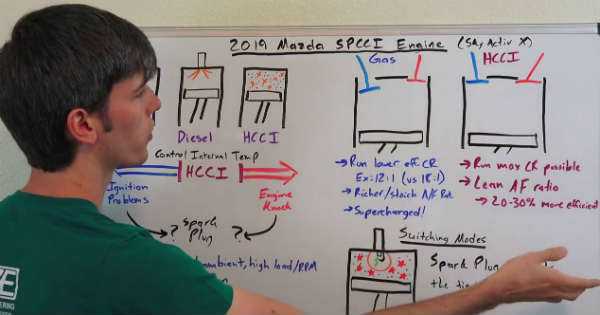 Mazda has been active in the vehicle market ever since its beginnings and some of the most inventions in the car industry have been developed by them, that is why we take a look at the following video which shows us the future of engines and is called the HCCI SkyAktiv-X. It is going to be first released in 2019 until 2030. This is Mazda`s vision of the future. The technology of this engine is something very cool. This engine represents the best of both worlds i.e. the gasoline and diesel engines. It is a blend between the efficiency of a diesel engine and the better emissions the gasoline engines have. The HCCI SkyAktiv-X has the mixture of air and fuel in the cylinders and as it presses down it ignites the fuel. Timing is crucial here as the temperature in the chambers ignites them. So the most important aspect of the whole system is to control and regulate the temperature in the cylinders. That is why they had to find the perfect balance hence if it is too cold you would have ignition problems and if it is too hot there will be engine knocks. A simple solution to this problem was to put in a simple spark plug. This system should become popular in the future hence it is going to be from 20% to 30% more efficient than the current engines. The HCCI SkyAktiv-X might become one of Mazda`s ultimate inventions. Check the video for more. What do you think of it? At last, check out the difference between diesel and gasoline engines.